For the first time in more than a dozen years, the Octagon returns to Boardwalk Hall in Atlantic City, New Jersey for UFC Fight Night: Barboza vs. Lee this Saturday, April 21. The last time the UFC held a show at Boardwalk Hall, Andrei Arlovski claimed the interim heavyweight title, Rich Franklin won the middleweight belt and future light heavyweight champ Forrest Griffin stepped into the cage for the first time after his epic clash with Stephan Bonnar at The Ultimate Fighter Finale, defeating Bill Mahood by first-round submission. While there are no championship belts on the line this time around, the card does boast a ton of intriguing and important fights across various divisions, as well as a few promising upstarts stepping into the cage looking to take another step forward in their journey up the UFC ladder. Here are three fighters to keep an eye on this weekend. This is On the Rise: Atlantic City Edition. 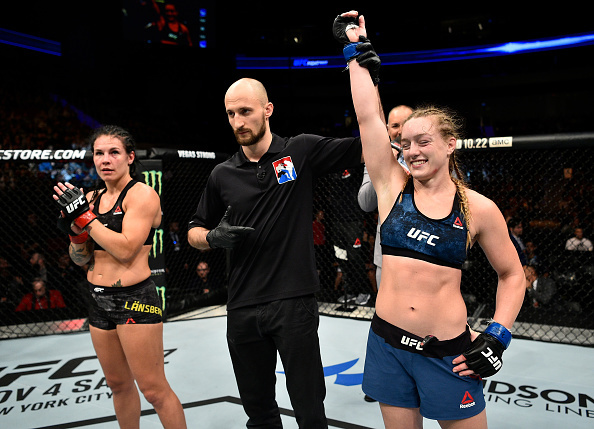 Arguably the top prospect on the women’s side of the sport – and undeniably one of the top overall prospects on the roster – Ladd earned her first UFC victory back in October, venturing to Poland and bouncing back after a shaky first round to finish Lina Lansberg in the second. The 23-year-old Folsom, California native is a perfect 6-0 in her young career, with all but one of those victories coming by way of stoppage. She faced stiff competition during her time fighting under the Invicta FC banner, logging wins over Amanda Cooper, Kelly McGill-Velasco and TUF 26 standout Sijara Eubanks before getting called to the big leagues and picking up right where she left off in her promotional debut last fall. For her sophomore appearance in the Octagon, Ladd is getting a serious step up in competition and a chance to prove she’s a factor in the bantamweight division as she takes on savvy veteran Leslie Smith. “The Peacekeeper” is the kind of polished, proven veteran every young talent needs to face (and beat) in order to move forward in their career, and if Ladd can keep her momentum rolling through this one, she could find herself with a spot in the Top 10 and a marquee matchup on the calendar in the second half of 2018. One of the top bantamweight prospects in the sport, Simon put himself on the UFC radar with a gritty, hard-fought victory over Donovan Frelow on the fifth week of Dana White’s Tuesday Night Contender Series. The victory pushed his record to 9-1 and extended his winning streak to three, and after adding two more victories – including a win over UFC vet Chico Camus – the 25-year-old from the Pacific Northwest was called to the Octagon to face Merab Dvalishvili this weekend. This is a quick turnaround for Simon, who successfully defended his LFA bantamweight title on March 23 with a 59-second knockout win over Vinicius Zani, but after missing out on a contract last summer, he wasn’t going to turn down the chance to step into the UFC cage this weekend. Dvalishvili made his promotional debut last December in Fresno and came away on the wrong side of a split decision result against Frankie Saenz. The loss snapped his six-fight winning streak that included a sudden stoppage win over another top regional prospect, Raufeon Stots, and you can be sure the Serra-Longo Fight Team member will be eager to get back into the win column here. Bantamweight is brimming with talent and is ultra-competitive at the moment, and a victory for Simon over the tough New York resident in his debut will add him to the growing crop of emerging, young fighters looking to make a name for themselves in the 135-pound ranks. Following his debut win over James Mulheron in July, Willis apologized for his performance, suggesting that the 15-minute affair wasn’t a proper representation of what he brings to the table and that he’d do better in his sophomore appearance in the Octagon. 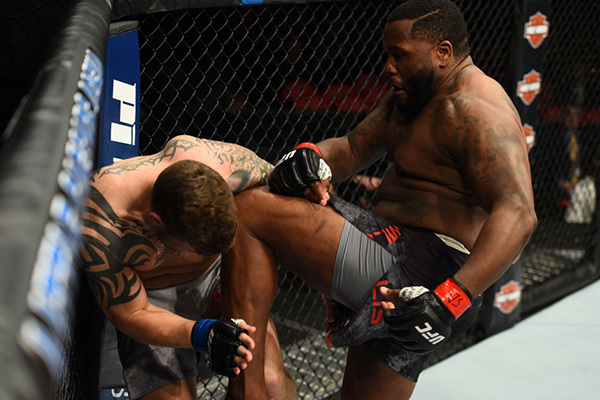 Five months later, “Big Pretty” made good on his promise, notching a first-round stoppage win over Allen Crowder to kick things off at UFC 218 in Detroit. With that impressive showing under his belt and riding a six-fight winning streak, the American Kickboxing Academy-based heavyweight returns to action in Atlantic City in a bout with Chase Sherman that should be electric from the outset. Several heavyweights have enjoyed breakout performances over the last eight or nine months and this is a chance for Willis to add his name to that list. His performance against Crowder flew under the radar because it opened the show in December, but if he’s able to replicate that performance here against a more experienced, more established opponent, you can be sure people will be including Willis in those conversations about heavyweights on the come-up in the UFC.